Disclaimer: I shall start this post by stating that the internal views of this article are that of the blogger himself and not Gyrus Systems as an entity. However, with that in mind; some things are sacred, and I will not be announcing any sort of partisanship or opinion as to who won the recent debate within the context of this post. If voting habits are inferred, either your sleuthing capabilities are very strong, or the answer was found elsewhere (outside the scope of this document). The first Presidential Debate of 2016 occurred this week, and people on both sides are fired up about it. Both parties are claiming victory and neither are backing down, and the viewers all have a lot to say. As one of those viewers and the blogger who prides himself on relevance and a cohesive storyline (especially in day to day & professional happenings), I sought out to discover a link between the events of what transpired on Debate night with a particular facet of the learning industry. After much deliberation and preparation of a well-crafted message, I finally landed on a variety of topics, which will be delivered in a persuasive tone as if produced in a debate forum. In order to properly write this blog post, I will be writing in accordance with the rules of the first Presidential Debate. I flipped a coin to determine whether or not I should even write this post, and then another to determine which of my two monitors I would be focused on for the duration of this blog post. I will be discussing a total of six topics, each of which I will only allow myself 15 minutes to write. The first two topics will focus on the direction of the “Learning Management Systems Industry (LMS).” The next two topics will be on “Successful Implementation of an LMS.” The final two topics will be focused on “Securing your LMS with emphasis on data security and establishing proper permissions.” With this in mind, and my trusty laptop timer working as a moderator, I will now begin. Disclaimer 2: There is a high likelihood that much like the debate itself, I will go over my self-allotted time limit. At such occurrence, I will most likely disregard the timer and continue with my prose. This is the inherent advantage of being both the participant and the moderator. So, I have already used some of my time. I’ll have to scramble a bit. The LMS industry is currently enjoying a popularity, unlike anything it has ever experienced before. In no time before this have, we witnessed the demand and competitive landscape which we are currently faced with today. This projection is set to grow throughout at least the next two presidential terms, and I for one would like to help educate potential users on all of the great features of which they can be getting out of their learning environments. To start, the technology which we are appreciating now is far vaster than anything we could have imagined a mere 10 years ago. Systems are capable of not only organizing Instructor-Led Training (ILT), but they now house E-Learnings, Gamification, Mobile Learnings, and alternative learning objects. The ways in which people learn are being considered universally in the production of learnings and how users interact. This is leading to new manners of participation, such as learning, the introduction of microlearning modules, and self-guided instruction. Topic 2: Where is the LMS Industry Going? In this moment of time, we as an industry are shifting focus, from ways to effectively deliver the highest quality training, towards a new vantage altogether. This being, how do we engage users? What can we do to make our training and development offerings exciting? This new overall perspective is helping create innovation through feature rich aspects of product design. Gamification is a real thing now, you can play games that teach you everything you need to know, effectively measure said games and embed them directly within your learning platform. That being said, these are new processes, and though they are already effective, there is a great room for improvement. Over the next few years, we will continue to see the introduction of more features within the space, leading to greater organizational buy-in a re-conceptualization on the entire learning process. As LMS adapt to these new features, they will need to continue improving on what is already there, SCORM content is at an all-time high, and ILT offerings are by no means a legacy form of teaching. Implementations are getting easier and easier. The LMS systems you rely on are getting smarter, and the people who perform these have a much better idea of the rules and requirements of your organization. In general, the implementation process is a lot less of a headache than it once was. If you are worried about the integration of components into your LMS, think about the real process required to get you up and running, and start prepping the components that input into your learning program to conform to the required needs of what you are looking to institute. There are still times when long-cycle implementations are normal, however, now… more often than not a real structured plan can be provided to your organization, which adheres to all the required facets you require in the system. Instead of struggling to get your program off and running. Establish the time commitment your organization needs to ready your data for the impending change, collect together your SCORM files and exterior learning objects, extract a first round export of your company’s HRIS, and by all means identify all the components in any legacy LMS software you may be using. The more detailed you are able to be, the more likely you are to be happy with the overall experience. The optimal LMS is the one that takes the least resistance to implementing. As stated previously, the less pain your LMS causes you during the implementation, and the more components that you can verify, get to, and action upon are at your disposal, the higher the likelihood of system satisfaction. Listen to the tips and strategies of your provided implementation expert, as there is a clear and definitive path of least resistance. If a component is holding back the final product from getting set-up you may experience push-back from organizational members who are afraid you may be in too deep. By listening to implementation experts, and extracting the files required to power your program, you can start to sit back and enjoy, as well as investigate some of the finer features which may or may not have been in the full scope of this project. Just what exactly should people be able to do within my LMS? “Managers need to see all of their classes, related classes that are taught inter-department, grades of students in certain classes, as well as have access to a few very specific reports in my system. Whereas students in my system need the ability to check themselves into a certain style of an available learning object, a personal report on their activities within the system, as well as a social profile to manage their interaction with peers.” Knowing that these types of things going into your product implementation will go a long way towards crafting an environment where you truly enjoy the capabilities of your application. If you are constantly creating new roles and permissions, and slowly severing emotional ties with the interaction, odds are you will begin losing the user-adoption which you strive so hard to achieve. Establish an LMS team to evaluate all the parameters you would like to assign roles in the system and focus on the LMS offerings that are able to adhere to your stringent guideline. How secure is your LMS environment? In cloud-based platforms, it is very important to be able to trust the security of your data. Your learning management systems are a wealth of knowledge for external parties, as such it is best to view the safeguards in place to secure the system in the event of any type of external exposure. In order to verify the status of your systems security, there are a few steps you will need to take to identify exactly what they are looking for. Firstly, don’t be afraid to ask the LMS company who you are partnering with to divulge the security measures in place for their hosted environment. Secondly, look up the industry recommended specifications for this practice. Where is the hosted solution physically located? What are the physical security features of the server location? How is it cooled? Powered? And what are the technological security features in place? What is the disaster recovery plan? And what is their documented up-time? These pieces of information can give you the valuable peace of mind that is required to fully trust the system you are about to put in place. 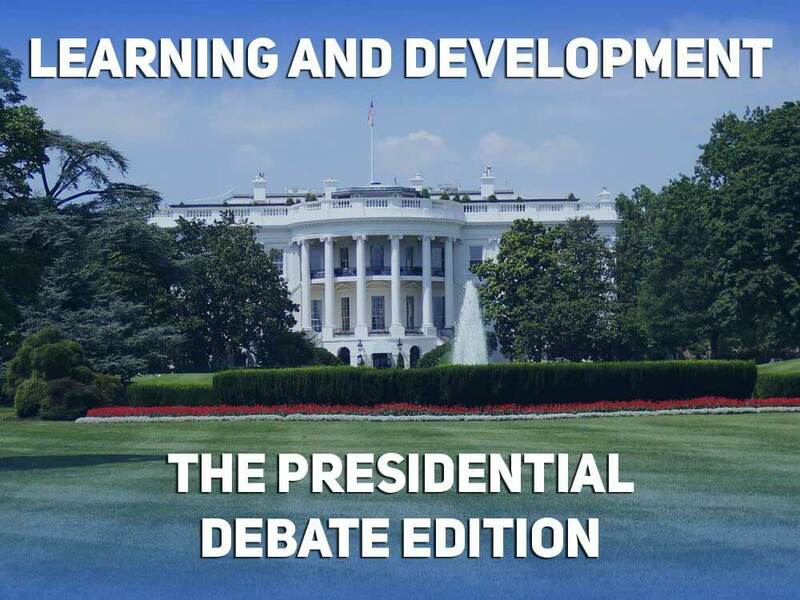 Just like in the Presidential Debate, in the LMS Industry, you will have to make a choice. So, now that you have heard all of my persuasive and rehearsed arguments, just how do you know what LMS to select? The choice is not easy, and it is completely up to your discerning tastes and abilities to match your specific needs with what is being offered. When selecting a Learning Management System, we like to offer the following advice. Go with what makes you happy, but make sure you consider the following aspects: Select a developer with a Long Standing Company and well-documented history of Innovation. Refer to their track record for outstanding customer service. Do not select the LMS of an organization that demonstrates an unwillingness to adapt to new technologies and accommodate to the needs of their users. In the eyes of the LMS developers,’ the user come first and everything is built experientially around that point. Select what works best for your specific situation and do not be afraid to customize an offering to suit your specific organizational needs. We hope you have enjoyed this blogger’s unique take on the first Presidential election. Be sure to tune in as we here at Gyrus Systems continue to investigate current events, the state of the learning and development industry, and what type of cool innovations are just on the horizon. Don’t forget to sign-up for our blog subscription on the top right corner of this page, where an automated email is sent to you with information on new posts, up to the minute that they’re released.